Imagine your group on mini-vacation to an art extravaganza featuring more than 1,300 artists from nearly every U.S. state and 47 other countries, with art exhibitions at more than 175 places in one city: Grand Rapids, Michigan. And there’s no entry fee. Welcome to ArtPrize, a 19-day-long celebration of art in every conceivable medium, featuring artists from around the world. It’s become one of the world’s most attended art event’s with more than 500,000 visitors. But don’t worry about the crowds; there will be plenty of room for your group to enjoy a day or longer touring the many venues across the city. This year, ArtPrize will take place from September 19 – October 7. Before ArtPrize, Grand Rapids had never hosted anything quite like it. It started in 2009 with 150 venues displaying the work of about 1,200 artists from all over. What the planners (and the city) were not prepared for was the level of interest. So many people came that restaurants ran out of food and hotels ran out of rooms. Needless to say, things got a little crazy. That first year, the public alone chose the $250,000 prize winner. 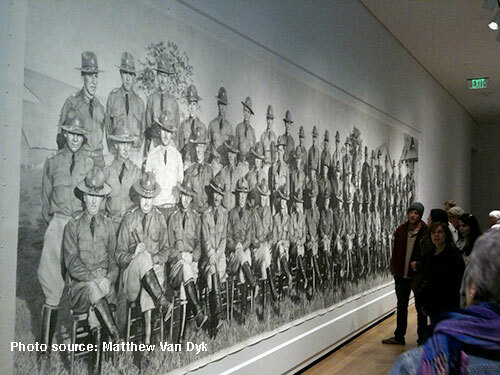 In 2010, a jury of artists, curators, museum heads, and critics was invited to judge juried awards and since, more than 3.2 million votes have been cast by visitors resulting in $4.1 million in awards to artists. Now, judges and the public choose winners. Today, ArtPrize awards total $500,000 in prizes as well as another $280,000 in grants to support artists and the arts. Among the endeavors is ArtPrize Pitch Night, an event occurring simultaneously in multiple U.S. cities to help artists bring their installment ideas to ArtPrize. The event also includes the speaker series, “Critical Discourse,” with art experts helping the public explore art topics. Similarly, “Education Days” involves almost 19,000 students from Pre-K to grade 12 from schools statewide. This year, a special ArtPrize Artist Challenge took place in March to choose one artist who would receive $15,000 to create an art installment for Calder Plaza in the heart of the city. The five-minute, five-slide competition was won by Mexico native, Gustavo Prado. One of the most unique aspects of ArtPrize is that, while it’s open to anyone 18 or older using any medium anywhere in the world, it is up to the artists to secure a venue for their art through “Connections.” This online system lets each artist choose possible venues and submit their profile to the venues who ultimately decide whether an artist’s work is right for their space. 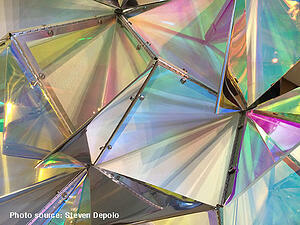 The competition classifies its art in one of four categories: 2-D, 3-D, time-based, or installation. The categories help to create a framework for the phenomenal diversity of works displayed during the event. When you register and attend, you will also be able to vote for any and all art you deem worthy of a prize. Just go to one of the many ArtPrize HUBS staffed with volunteers and they will help you set up your account. There are two rounds of voting: the first to narrow the field to the top five from each of the four categories, and the second to decide the prize winners. That’s 20 winners for the judges and 20 for the public. The folks at ArtPrize, who know this event has become an international favorite, help out by providing resources for planning your trip. For example, ArtPrize hotel packages are available at 29 different hotels, including the Amway Grand Plaza, J.W. Marriott Grand Rapids, Courtyard by Marriott, Best Western, Clarion, Comfort Inn, Comfort Suites and more. Once you’ve arrived, you can get ArtPrize information at the Visitors Pavilion on Rosa Parks Circle including free Event Guides, Experience Guides, and if you bring your family, ArtPrize Labs Family Activity Kits. For folks in your group requiring mobility assistance, wheelchair loans will be available. 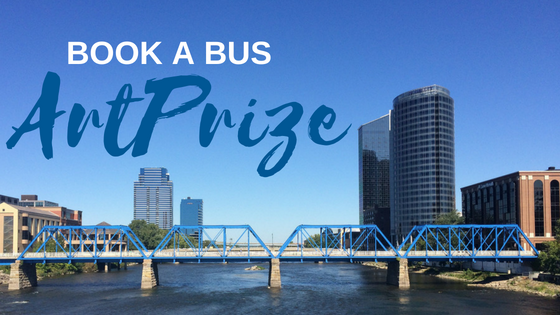 Don’t wait another minute to book a bus to ArtPrize this fall. You can learn more about Indian Trails charters and get a quote to get you on your way!